The State of the Union is the annual speech the president gives to the joint session of Congress. The U.S. Constitution, Article II, Section 3, says, "The president shall from time to time give to the Congress information of the state of the union, and recommend to their consideration such measures as he shall judge necessary and expedient." The SOTU outlines the president's priorities for each year. For that reason, it previews which areas will receive the most funding in that year's budget. The SOTU reports on the state of the country's economy. It provides a vision for the future. Presidents use it as a rallying cry in times of economic uncertainty or war. The president's cabinet attends, along with all members of Congress and their guests. The nine sitting Supreme Court justices are also invited to attend. Other attendees include the members of the Joint Chiefs of Staff and other Defense Department leaders. The president also picks guests to join the first spouse in the gallery. President Ronald Reagan started the tradition in 1982. Here are summaries of the State of the Union addresses given by Presidents Donald Trump and Barack Obama. You can compare their policies to determine if Trump or Obama is better for the economy. 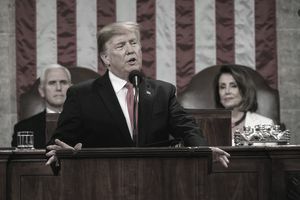 President Trump's second official State of the Union address was February 5, 2019. Most SOTUs occur in January, but Speaker of the House Nancy Pelosi rescheduled it. She cited security concerns caused by the government shutdown that didn't end until January 25. Trump's immigration policies led the speech. He asked Congress to fund the wall on the Mexican border. He did not threaten to shut down the government again or declare a national emergency if the wall wasn't funded. He touted the success of tariffs on Chinese imports. He asked Congress to approve the North American Free Trade Agreement renegotiation. Trump called for the end of U.S. military presence in the Middle East. His administration is negotiating an end to the Afghanistan War. He also set the dates for the next meeting with North Korea's leader Kim Jong Un. The president asked for more bipartisanship now that the House is controlled by Democrats. He mentioned infrastructure projects and lowering prescription drug costs as goals both parties support. He announced an initiative to end all new HIV infections by 2030. Trump also promised that "America will never be a socialist county." Many interpreted this as a dig against the Democratic party. The president highlighted many accomplishments, which the Washington Post fact-checked. Trump spoke for 1 hour and 22 minutes. It was the third-longest SOTU speech in U.S. history. President Bill Clinton had the two longest. In 2000, Clinton's SOTU lasted 1 hour and 28 minutes. In 1995, he spoke for 1 hour and 24 minutes. President Trump's first official SOTU was January 30, 2018. He talked about the recent tax cut plan and record-setting stock market success. Trump reiterated his America First trade policies, which included renegotiation of NAFTA. Trump renegotiated NAFTA with five changes. He also amended the bilateral agreement with South Korea. He promised to cut prescription drug prices. The American Patients First plan would allow Medicare to negotiate drug prices. Trump asked Congress to approve a $1.5 trillion plan to rebuild America's roads and bridges. It said that $200 billion in federal spending would leverage another $1.3 trillion in private investment. He promised to cut regulations that slow construction. Congress approved $20 billion for infrastructure in the FY 2018 budget. ot accomplished. He asked Congress to remove the sequester for military spending. Approved for FY 2018 and FY 2019. Trump suggested vocational schools, job training, and paid family leave. He established the National Council for the American Worker to train workers for high-demand industries. Congress didn't move forward with the Paid Family Leave Plan. Trump promised to end the opioid epidemic by providing treatment and boosting enforcement. Trump signed a bill to find non-addictive pain medications. It also expands access for Medicaid patients to substance abuse treatment. He asked Congress to support his immigration plan. It asked for $25 billion to build a wall along the border with Mexico. It limits green cards to spouses and children and ends the diversity visa lottery. Trump promised to add more Immigration and Customs Enforcement officers to crack down on gang members. Mostly accomplished, except for wall funding. Trump promised to impose sanctions on Cuba and Venezuela. He would rely more heavily on the Guantanamo Bay detention facility. He asked Congress to review the Iran nuclear agreement. Trump withdrew from the Iran agreement. President Trump's joint address to Congress was February 28, 2017. He confirmed many elements of his economic plan as he outlined it during the course of the 2016 presidential campaign. Trump promised to repeal and replace Obamacare. He would protect those with pre-existing conditions. He would expand tax credits and Health Savings Accounts to help people pay for insurance. He would give states block grants to pay for Medicaid. He would allow people to buy insurance across state lines. He mentioned legal reforms to protect patients and doctors from costs that drive up insurance and drug costs. That includes shortening the drug approval process at the Food and Drug Administration. Trump weakened Obamacare without replacing it. He expanded the medical tax deduction. He is expanding short-term health insurance policies to allow people to buy insurance across state lines. Trump asked both parties to work together to make child care affordable and give parents paid family leave. He asked Congress to pass an education bill that funds school choice, including religious and homeschooling. He included a deduction for that in his tax plan. He created the office of Victims of Immigration Crime Engagement to crack down on immigrants who committed violent crimes. Trump promised a $1 trillion infrastructure bill financed with public and private investments. Not achieved. Trump said he would increase the Department of Veterans Affairs budget and the Department of Defense budget by 10 percent. He would cut foreign aid and the budgets of the Environmental Protection Agency and other non-defense departments to do so. He would ask Congress to rescind the sequester. All included in his 2018 budget. Trump also requested $10 billion to $20 billion for the Mexico border wall. He wants to add $30 billion in emergency funding to the Fiscal Year 2017 budget. These ambitious proposals can only be accomplished if he cuts non-defense budgets by 10 percent and completely eliminates foreign aid. He did not receive funding for the wall. He mentioned support for clean air and water. Offer pre-kindergarten for all. Offer every student computer science and math classes. Provide free community college to responsible students. Not achieved. Strengthen Social Security and Medicare. Expand tax cuts to low-income workers. Retrain workers. If the new job doesn't pay as much, offer wage insurance. Showcase employers who exhibit best practices. Not achieved. Higher taxes and fewer subsidies on fossil fuels. Put Joe Biden at the head of a new cure cancer initiative. No progress. Asked Congress to authorize military force against the Islamic State group. The military will continue to work with local forces in Syria and other failing states. Achieved. Obama asked Congress to approve the Trans-Pacific Partnership to offset China's power in the region. The TPP and the Transatlantic Trade and Investment Partnership are blocked by Democrats, who are worried they promote job outsourcing. Combined, these agreements would add $14 billion a year in exports. Not achieved. End gerrymandering. Find a solution to campaign finance reform. Make it easier to vote. Not achieved. Obama also said he would like to accomplish the following things: advance judicial reform, fight prescription drug abuse, help students write computer code, fix a broken immigration system, provide equal pay for equal work, and raise the minimum wage. Not achieved. If adopted, Obama's proposals would have stimulated growth and job creation by boosting demand. They were opposed by Republicans who support Reaganomics and hold a majority in Congress. He used this speech to frame the discussion and challenge them to come up with their own proactive proposals. 1. Tax Reform: Obama wanted to raise $320 billion in 10 years by raising the top capital-gains tax rate from 23.8 percent to 28 percent. It applies to the highest 1 percent of earners. He also wanted to extend the capital gains tax on inherited assets and increase taxes on banks that use a lot of debt and derivatives for trading. Not achieved. It would have paid for $235 billion in tax cuts for the middle-class over the next 10 years. This includes a $500 tax credit for moderate-income households with two earners, tripling the child-care tax credit to $3,000 a year, and permanently extending the earned-income credit. Obama wanted to close corporate tax loopholes to fund $150 billion for infrastructure spending. He would lower rates for businesses that create U.S. jobs, and raise them for those that create jobs overseas. 2. Middle-Class Economics: This is another name for reversing income inequality. It included the Women's Paycheck Fairness Act and raising the U.S. minimum wage to a living wage. It also included these elements: Help states require seven days of paid sick leave for all workers. Make tax-advantaged retirement savings plans automatic (opt-out rather than opt-in). Fund more infrastructure projects, including faster internet, to support a 21st-century economy and job creation. Only approve the Keystone Pipelineif it was part of a larger infrastructure plan. 3. Precision Medicine Initiative: This furthers the computerized medical records begun in the American Recovery and Reinvestment Act and the Affordable Care Act. It provides data needed to cure diseases and give patients electronic access to their own medical records. 4.Attack Climate Change: Ratify an agreement with China on climate control. More stringent methane emissions standards. Based on a 2014 strategy to cut methane emissions by 16 percent from 2012 levels by 2020 through regulations. Succeeded with the 2015 Paris Climate Agreement. Trump abandoned it. 5. Immigration Reform: Obama's executive order prioritized the deportation of illegal immigrants who had committed felonies. He deported 400,000 a year. Immigrants who lived in the United States for five years or more, and had children who were citizens or legal residents, could apply for three years of deportation protection. They had to register, pass criminal background checks, and pay taxes. Success. He challenged Congress to reform the U.S. immigration process. Not achieved. 6. Help Improve Workers' Skills: Make two years of community college free. Train and hire more veterans. Streamline the education tax credit to give more college students $2,500 each year for five years. 7. Defense: Ask Congress to pass a resolution for the use of force against ISIS. Work with allies to address the resurgence of ISIS and other terrorist groups. Focus on cyber-terrorism at home. Use economic sanctions, like the ones that worked against Russia. Veto any Congressional trade sanction against Iran, which could disrupt ongoing negotiations. Asked Congress to pass legislation needed to fight cyber threats. 8. Trade: Ask Congress to pass the Trade Promotion Authority. Success. End the embargo against Cuba, extending Obama's easing of trade relations. Success. Close the Guantanamo prison. Not achieved. Obama's 2014 SOTU was January 28, 2014. He focused on job creation, global warming, and ending the War in Afghanistan. Tax Code Overhaul: Lower taxes on companies that create U.S. jobs and raise them on ones that outsource. No action. Instead, Obama created a new savings bond called "MyRA" to help workers without pensions or 401(k)s save for retirement. Workers would sign up to have part of their paycheck automatically deducted, and put into Treasury bonds. The account would have the same tax break as IRAs and gives Americans the same right for automatic savings at work that Congress has. Trump ended it in 2017. Create Jobs - Pass the rest of the American Jobs Act, fund more infrastructure, and raise the minimum wage to $10.10/hour. Obama's executive order required businesses with government contracts to raise the minimum wage to $10.10 an hour by 2015. That level is enough to sustain families above the poverty level and keep up with the cost of living. Pass transportation and waterways bills to protect 3 million jobs. Waterways bill passed, only a stop-gap transportation funding bill was passed. Undo budget cuts to federally-funded R&D. Funding remained below pre-sequestration levels, except for research on Alzheimer's, pediatrics, and Ebola. Launch six more technology hubs like the ones created in Raleigh, N.C., and Youngstown, Ohio. Included in 2015 budget. Streamline permitting process for construction projects. Done by executive order. Create new public-private partnerships for manufacturing innovation and technology. Hire the long-term unemployed and people looking for their first job. Streamlined federal job training programs. Attack Global Warming - Switch more cars to natural gas by adding fueling stations. Not funded. Transfer $4 billion in subsidies from to oil companies to renewable fuels companies. No action. Protect federal lands through executive orders. He designated four national monuments. Set carbon standards for existing power plants, similar to those for new coal- and gas-fired plants. The EPA required plants to lower emissions by 30 percent by 2030. Trump revoked the Clean Power Plan in 2017. Obama hiked fuel-economy standards for cars and light trucks to 54.5 miles per gallon by 2025. He did the same for heavy-duty trucks. They must improve their fuel efficiency 20 percent by 2018. Immigration Reform - Pass the Senate's Comprehensive Immigration Reform Bill, which allows immigrants to become citizens if they learn English, pass a criminal background check, and pay any back taxes. They'd also pay a citizenship fee, and wait in line behind legal immigrants. It also doubles the number of border security agents, cracks down on businesses that hire illegal workers and increases the number of guest worker visas. Instead, the House proposed a bill that would require Homeland Security to report how it will control U.S. borders in two years. Mandate all businesses use the federal E-Verify employment database system. Give more green cards to foreign-born graduates who majored in math and science at U.S. universities. Create a program for farm workers. Allow states to enforce federal immigration laws. Grant legal status to 11.5 illegal immigrants, with an opportunity to get a green card. Open a similar pathway to children brought to the United States. Education: Promote education as a way out of poverty. This includes federal programs that work with states to make preschool available to every child in America because every dollar invested saves $7 later on. Thirty states have already done so, and Obama said he will put together a coalition to make the "Race to the Top" program for preschoolers. The Federal Communications Commission, Apple, and major internet providers are installing broadband in high schools. The government established more partnerships with companies to provide math, science, and high-tech training to high school students. Limit loan repayments to 10 percent of income. Obama ordered the Department of Education to do so. Defense and Trade: End the War in Afghanistan. Done, with 9,800 troops to train Afghanis. Keep domestic defense strong, but move off a permanent war footing. Reduce use of drones. Reform surveillance programs to protect domestic privacy. Close Guantanamo Bay because it's unconstitutional. Rely on diplomacy as well as military might. Keep Iran from obtaining a nuclear weapon. Obama promised to provide more health care, including mental health care, for returning veterans. He also promised more job training and support for families. Partially done with Iran nuclear agreement and Obamacare. Gun Control - Pass any gun control legislation. No action by Congress. New regulations included clarification on who is diagnosed as mentally ill to keep them from buying firearms, reduced barriers to states submitting data to the National Instant Criminal Background Check System, and an FBI rule that allowed law enforcement to run a full background check before returning a seized gun. The Justice Department gave $1 million to the National Crime Prevention Council to teach safe firearms storage. Trump overturned Obama's regulation. Debt Reduction - Implement existing Obamacare healthcare cost savings and new taxes. Job Creation - Same as 2014, except raise the minimum wage to $9/hour. Attack Climate Change - Develop U.S. energy, alternative energy, and fund energy efficiency. Immigration Reform - Stronger border security, a path to citizenship for illegal immigrants, and a guest worker program. Education - Same as 2014, and reward higher education for cutting costs. Gun Control - Strengthen gun control through a Senate bill to strengthen background checks and ban military-style assault rifles and high-capacity magazines. But, according to Washington Post’s article, "Say What!" the bill was defeated. Tax Code Overhaul, Defense and Trade, and Gun Control - Same as 2014. Most of Obama's priorities in 2013 did not make it past a House controlled by Tea Party Republicans. Instead, he spends his political capital negotiating with Congress to raise the debt ceiling and passing a budget. It ended with a 16-day government shutdown in October. After that, he was busy defending and tweaking Obamacare in response to criticism over delays and technical malfunctions of the web site. Obama kept his promise to lower the U.S. deficit without cutting Social Security and Medicare benefits. His 2013 executive order to increase information-sharing to combat cyberattacks blew up in his face. He was severely criticized for allowing the National Security Agency to snoop into Americans’ online habits and emails. Obama's fourth SOTU was January 24, 2012. It presented an Economic Blueprint to address income inequality. Extend the 2010 tax cuts to everyone except those making $250,000 a year or more. Approve the American Jobs Act. It would extend the payroll tax cut as well as extended unemployment benefits. He also wants to eliminate tax breaks for companies that move jobs overseas, lower taxes for companies that hire Americans, and give tax breaks for companies that build in distressed areas and train workers. Strengthen the domestic energy industry by developing natural gas, reduce tax credits for oil exploration, give tax credits for alternative energy development and allow the development of clean energy on enough public land to power three million homes and direct the Navy to purchase enough capacity to power a quarter of a million homes a year. Train 2 million of the structurally unemployed, extend the tuition tax credit, and double the number of work/study jobs. Give mortgage holders $3,000 a year with a refinancing program, funded by a small fee on the big banks. Retain the Dodd-Frank Wall Street Reform Act. Ban insider trading among Congressmen. Reduce the corporate tax rate, but close loopholes so the net effect on the budget would be zero. Freeze discretionary spending budget at current levels, which "would reduce the deficit by more than $400 billion over the next decade." Let the Bush tax cuts expire for those making over $250,000. Approve a free-trade agreement with South Korea. Cut oil consumption by 785 million barrels by 2030, boost renewable-energy investment by more than 85 percent, end the $4 billion-a-year in tax subsidies to oil and gas producers, and add 1 million alternative energy vehicles by 2015. The immediate impact of Obama's business-friendly speech was the Dow went above 12,000 for the first time since 2008. Pass the Dodd-Frank Wall Street Reform Act. Passed on July 21, 2010. Agree to economic stimulus for small businesses. Obama's plan included $33 billion in tax credits for those that added new workers or gave raises beyond a cost-of-living increase. It raised the limit on SBA loan guarantees from $2 million to $5 million. It took $30 billion from TARP for 8,000 community banks and eliminated capital gains taxes for investors in small businesses. Step up programs to encourage refinancing so that homeowners can move into more affordable and sustainable mortgages. Not much changed. Allow bankruptcy proceedings to renegotiate all debts. This didn't happen. Find out how the 2005 Bankruptcy Act helped cause the recession. Freeze non-security discretionary spending for three years. Create a bipartisan Fiscal Commission. Launch a National Export Initiative to help small businesses. Free trade agreements with South Korea, Panama, and Colombia. Approved. End tax breaks for companies that outsource jobs. ​Included a permanent extension of the Research and Experimentation tax credit in the FY 2012 budget. Pass the Jobs Bill. Passed in February as the small business stimulus package. Obama's first SOTU was February 24, 2009. He delivered it in the midst of the Great Recession. He announced the passage of the American Recovery and Reinvestment Act, which ended the recession by July 2009. He promised to double the supply of renewable energy by 2012 by spending $15 billion a year. He asked Congress to set a cap on carbon.